Mass gainers is all about two things: building and maintaining muscle mass. This is a protein formula that will help you achieve your maximum potential by increasing muscle cell size and strength. It will give you the incredible maximal results you deserve when supplemented with a high calorie diet. This product is also perfect for anyone losing too much muscle from their daily activities and need additional calories to help sustain and improve their body weight. For people with a fast metabolism, this is one of the best products created to help you finally gain some of that muscle and weight you have been seeking. This product is a supplement that contains multi-functional proteins to supply the muscles with amino acids at a sustained rate. It will nourish your muscles and body with BCAA’s, essential and non-essential amino acids, glutamine, fibre, and carbohydrates. If you’re finding it difficult to consume the right amount of energy so that you can reach your ultimate muscle goals, then you’ve come to the right place. 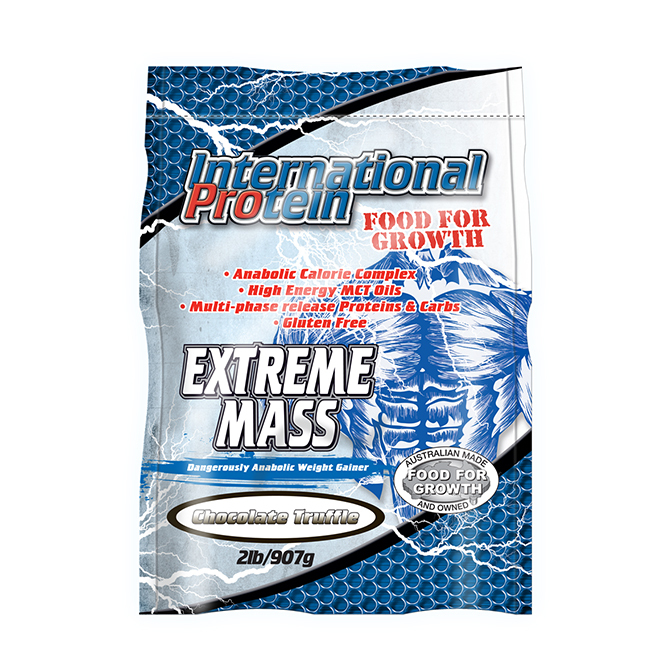 International Protein’s Extreme Mass formula was designed as a high strength mass building supplement. This nutrient dense blend contains 5 different types of protein, complex carbohydrates combined with canola and sunflower oils. These ingredients put major importance on guaranteeing the body remains in a highly anabolic state to optimise muscle gains. The five different proteins included in this blend are whey protein concentrate, whey protein isolate, micellar casein, hydrolysed whey protein isolate and egg albumin which were selected based on their special rates of absorption. Each of these proteins contain different absorption rates which means this supplement will act as both an anabolic enhancing supplement and will also produce an anti-catabolic effect. 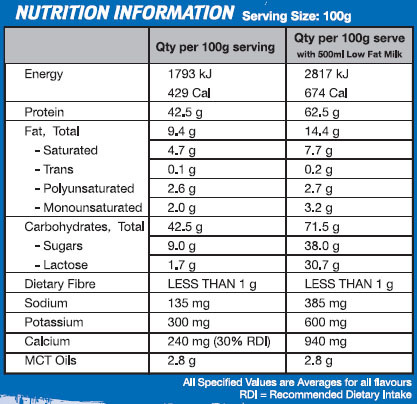 This product also contains MCT oils which work to provide more energy per gram compared to carbs and protein. They are extremely efficient and are rich in the good saturated fats to further enhance your energy levels. The saturated fat content in MCT oils is balanced out by a blend of canola and sunflower oils which are high in monounsaturated and polyunsaturated fats including linoleic (omega 6), Linolenic (Omega 3) and essential fatty acids (EFA’s). Another important feature of this extreme mass supplements is its amino acid composition which all the necessary amino acids required for muscle growth and recovery. This high calorie supplement will improve your anabolic state so that you can put on muscle fast and increase your power. With a high carb content and fast burning MCT oils, this product is ideal for serious mass gaining. Mix three (3) scoops with 300mL of water and consume immediately after completing your workout (post-workout) Can be taken as a meal replacement for breakfast and or whenever a meal replacement/protein is needed in the day.